Dr. Lyons makes every effort to stay knowledgeable about the latest techniques and developments in the ever-advancing field of dental technology. Should you have an emergency, wish to schedule your first comprehensive exam and teeth cleaning, or if you have been with us since the beginning, thank you for visiting the practice of Dr.P.A.Lyons online! Our office manager and staff are experts in making people feel at ease when it comes to Dental care. We coordinate our schedule to yours so that your dental treatment can be completed at your pace.Some patients prefer longer appointments which allows them to complete several procedures at once, while others prefer to spread out their treatment. Whatever the preference, our dental team will make all the necessary arrangements so that you can comfortably afford your care and maximize your dental insurance benefits. Our staff plays an important role in ensuring patient satisfaction at all times! We provide many exciting services that will leave you with a bright, white smile. The best way to preserve health of your gums and your teeth is to maintain a sensible oral hygiene regimen. This includes not only twice a day brushings and routine flossing, but also regular dental examinations and professional cleanings. Many patients who first came to us for cosmetic work continue to make regular appointments with us for comprehensive care.We invite you to schedule an appointment for a comprehensive examination even if you feel that your mouth does not hurt. The first step in maintaining a healthy mouth is preventing tooth decay and sealants can offer major protection against cavities. They also help small areas of decay from becoming larger. Children and teenagers are obvious candidates for sealants, but adults can benefit from them as well. Sealants help save money, as prevention of cavities, is better than the treatment of restoring decayed tooth structure. Timely repair can make the difference between saving and losing a damaged tooth. Root canal treatment helps an infected or abscessed tooth to become healthy. To make it functional again, a crown is needed to prevent cracking or breaking. Also known as gum disease is an infection of the gums and bone that hold teeth in place. If not treated, it could worsen and eventually lead to loss of teeth. Most times it is painless until the problem becomes severe. Research suggests that there may be a link between periodontal disease and other health concerns such as diabetes, cardiovascular disease, stroke, bacterial pneumonia, and increased risk during pregnancy. It is a cover for a tooth weakened by decay or repeated large fillings. Crowns are custom made to fit your teeth, giving them strength, function, and beauty. They can be made of different materials to complement your appearance and needs.Replacing teeth: Tooth loss has many causes: decay, gum disease, and injuries are the most common.Missing teeth make you feel self-continuous and make eating and speaking more difficult. They are tooth replacements that attach to adjoining natural teeth that are healthy. Bridges can only be removed by your dentist. Full dentures replace all the teeth in a jaw. These are best for people with several teeth missing and whose adjoining teeth are not in the right position to hold a bridge. Custom crowns made to fit the investment you made with implants. Patients now have the freedom to eat and smile without removing their teeth at night! To find out if implants are right for you, please contact us today. If you are like the rest of us, you have most likely adopted habits that don’t exactly lead to white teeth. Coke? Soda? Red wine? Chances are you’ve tried some version of grocery store whitening. Perhaps a whitening tooth paste. Maybe some whitening gum. You might have even tried some sort of paint on or “strip type” product. They might have sounded like a simple cure for your dimming teeth, but you want a whiter smile. It is time for you to experience the difference of a professional white. To learn more contact our office. Crooked and crowded teeth are hard to take care of and clean, which may lead to tooth decay, gum disease, and possible tooth loss. Bad bites can also cause difficulty in speaking and chewing; Cause abnormal wear on tooth surfaces; and lead to problems with bones, jaw joints, and gum tissue. Correcting these problems can make your mouth healthier and give you a great smile! Show the world who you really are. Invisalign is a virtually invisible solution so you can smile during as well as after treatment. Invisible. Removable. And Comfortable. Your smile is the first thing others notice about you and like it, or not, it says more about you than other physical feature. So what if nature didn’t give you a perfect smile? Lumineers are veneers that can fix uneven spacing, lengthen short teeth and even reshape awkward or dark teeth without painful shots or drilling. To learn more of a life-changing smile that is in your future, contact us today for an appointment. Shhh.. No one would know you got Botox and Juvederm at the dentist! At Padma Lyons,D.D.S., you can discover the proven results that 11 million men and women have experinced. With real, noticeable results, no surgery and no recovery time, Botox and Juvederm is the preferred choice for many of our clients. A beautiful new smile can work wonders for your appearance and self-esteem. You feel 10 years younger than your age.Why not look it? Compliment your smile with a softer, younger appearance with Botox and Juvederm treatments. Fillers can correct moderate to severe facial wrinkles and folds around the mouth. They are also used to plump lips so that you have a fuller more youthful smile. As we age , some patients get frequent infections at the corners of the mouth. In addition to repairing teeth, fillers can correct this problem so that bacteria and yeast don't get trapped in the corners. An upward lift can help keep the corners stay dry and healthy. 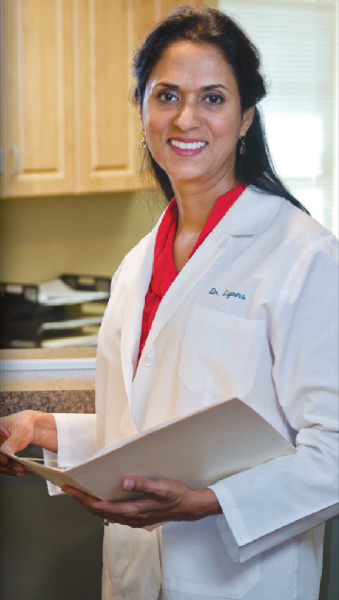 Dr. Lyons makes dental appointments anxiety free. She is warm, patient and very skilled.I do not dread going in for a dental cleaning anymore! I have been a client of Dr. Lyons for several years and she is by far the best dentist I have ever had. She is caring, passionate and very particular about the quality of her work. Quite frankly, she’s the best! I first stepped into Dr. Lyons’s office when I was seven years old. Seventeen years later, I’m still here. It’s hard to believe it has been that long, but then again I cannot imagine going anywhere else. I can’t relate to the stereotypical “horror” stories of children at the dentist because I have never once had such an experience with Dr. Lyons. I actually look forward to my appointments and see them as an opportunity to catch up with great friends. I have been going to Dr. Lyons since I was in elementary school, and I have to say she is awesome. In addition to taking great care of your teeth, she keeps you well informed of all procedures taking place. Her staff is very professional and extremely helpful. You can tell everyone wants to provide the best environment possible, and it shows throughout your experience. I highly recommend!